It’s often said that “data is the fuel of machine learning.” This isn’t quite true: data is like the crude oil of machine learning which means it has to be refined into features — predictor variables — to be useful for training a model. Without relevant features, you can’t train an accurate model, no matter how complex the machine learning algorithm. The process of extracting features from a raw dataset is called feature engineering. 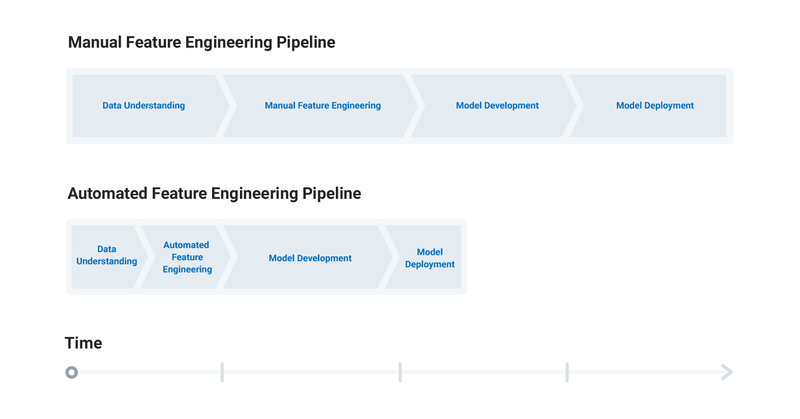 The Feature Engineering ProcessFeature engineering, the second step in the machine learning pipeline, takes in the label times from the first step — prediction engineering — and a raw dataset that needs to be refined. Feature engineering means building features for each label while filtering the data used for the feature based on the label’s cutoff time to make valid features. These features and labels are then passed to modeling where they will be used for training a machine learning algorithm. The process of feature engineering. 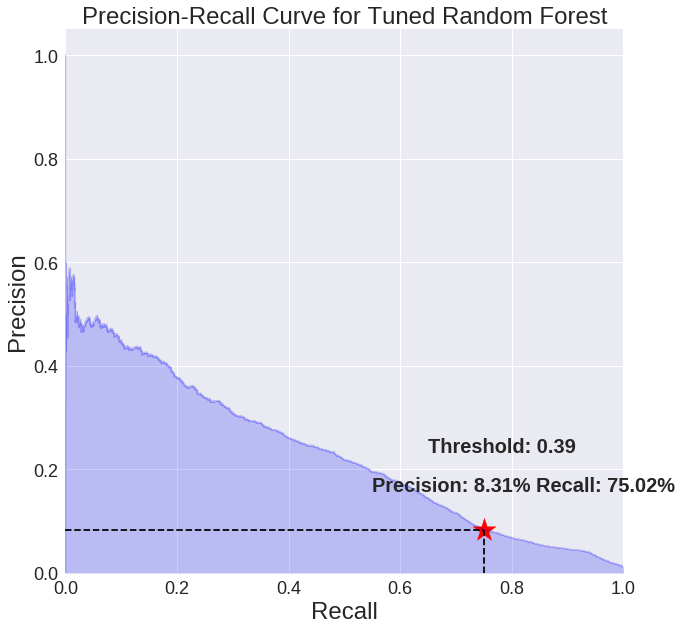 While feature engineering requires label times, in our general-purpose framework, it is not hard-coded for specific labels corresponding to only one prediction problem. If we wrote our feature engineering code for a single problem — as feature engineering is traditionally approached — then we would have to redo this laborious step every time the parameters change. Instead, we use APIs like Featuretools that can build features for any set of labels without requiring changes to the code. This means for the customer churn dataset, we can solve multiple prediction problems — predicting churn every month, every other week, or with a lead time of two rather than one month — using the exact same feature engineering code. This fits with the principles of our machine learning approach: we segment each step of the pipeline while standardizing inputs and outputs. This independence means we can change the problem in prediction engineering without needing to alter the downstream feature engineering and machine learning code. The key to making this step of the machine learning process repeatable across prediction problems is automated feature engineering. Traditionally, feature engineering is done by hand, building features one at a time using domain knowledge. However, this manual process is error-prone, tedious, must be started from scratch for each dataset, and ultimately is limited by constraints on human creativity and time. Furthermore, in time-dependent problems where we have to filter every feature based on a cutoff time, it’s hard to avoid errors that can invalidate an entire machine learning solution. Automated feature engineering overcomes these problems through a reusable approach to automatically building hundreds of relevant features from a relational dataset. Moreover, this method filters the features for each label based on the cutoff time, creating a rich set of valid features. In short, automated feature engineering enables data scientists to build better predictive models in a fraction of the time. Manual vs Automated Feature Engineering Pipelines. After solving a few problems with machine learning, it becomes clear that many of the operations used to build features are repeated across datasets. For instance, we often find the weekday of an event — be it a transaction or a flight— and then find the average transaction amount or flight delay by day of the week for each customer or airline. Once we realize that these operations don’t depend on the underlying data, why not abstract this process into a framework that can build features for any relational dataset? This is the idea behind automated feature engineering. We can apply the same basic building blocks — called feature primitives — to different relational datasets to build predictor variables. As a concrete example, the “max” feature primitive applied to customer transactions can also be applied to flight delays. In the former case, this will find the largest transaction for each customer, and in the latter, the longest flight delay for a given flight number. This is an embodiment of the idea of abstraction: remove the need to deal with the details — writing specific code for each dataset — by building higher level tools that take advantage of operations common to many problems. Ultimately, automated feature engineering makes us more efficient as data scientists by removing the need to repeat tedious operations across problems. Currently, the only open-source Python library for automated feature engineering using multiple tables is Featuretools, developed and maintained by Feature Labs. For the customer churn problem, we can use Featuretools to quickly build features for the label times that we created in prediction engineering. (Full code available in this Jupyter Notebook). We have three tables of data: customer background info, transactions, and user listening logs. If we were using manual feature engineering, we’d brainstorm and build features by hand, such as the average value of a customer’s transactions, or her total spending on weekends in the previous year. For each feature, we’d first have to filter the data to before the cutoff time for the label. In contrast, in our framework, we make use of Featuretools to automatically build hundreds of relevant features in a few lines of code. This one line of code gives us over 200 features for each label in cutoff_times. Each feature is a combination of feature primitives and is built with only data from before the associated cutoff time. Sample of features from Featuretools automated feature engineering. The features built by Featuretools are explainable in natural language because they are built up from basic operations. For example, we see the feature AVG_TIME_BETWEEN(transactions.transaction_date). This represents the average time between transactions for each customer. When we plot this colored by the label we see that customers who churned appear to have a slightly longer average time between transactions. 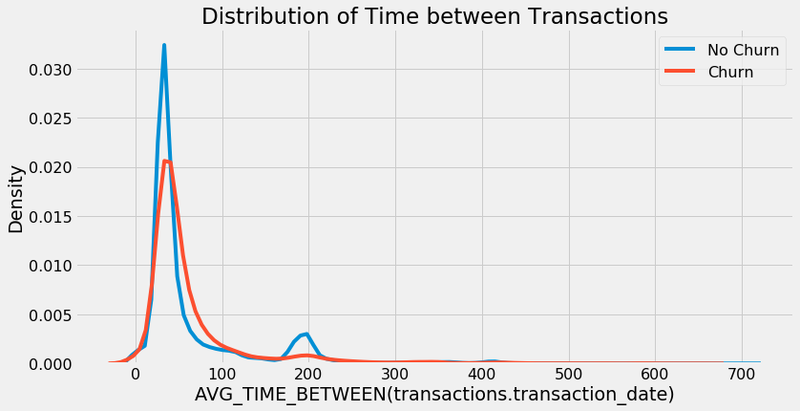 Distribution of time between transactions colored by the label. In addition to getting hundreds of valid, relevant features, developing an automated feature engineering pipeline in Featuretools means we can use the same code for different prediction problems with our dataset. We just need to pass in the correct label times to the cutoff_times parameter and we’ll be able to build features for a different prediction problem. Automated feature engineering means we can solve multiple problems in the time it would normally take to complete just one. A change in parameters means tweaking a few lines of code instead of implementing an entirely new solution. Just as the label times from prediction engineering flowed into feature engineering, the features serve as inputs to the next stage, modeling: training an algorithm to predict the label from the features. In the final article in this series, we’ll look at how to train, tune, validate, and predict with a machine learning model to solve the customer churn problem. Furthermore, the feature engineering code is not hard-coded for the inputs from prediction engineering which means we can use the same exact code to make features for multiple prediction problems. Applying automated feature engineering in a structured framework we are able to turn feature engineering from a painful process into a quick, reusable procedure allowing us to solve many valuable machine learning problems.